There is no absolute 100% right way to house your Gouldian finch. Space availability, geographic location and financial resource all play a role in determining how best we can house our birds, and what works for one person’s set up may not work for another. Having said that, if you want to get the most out of your Gouldian finches then look no further than Mother Nature for inspiration on how best to house her most prized jewels. 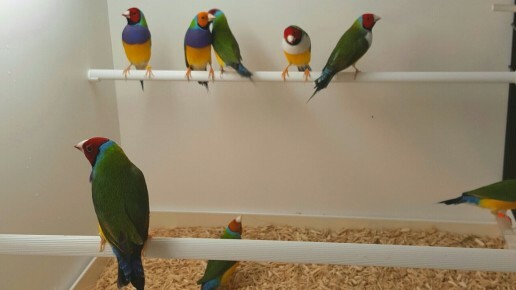 A good philosophy to adopt when it comes Gouldian finch husbandry, or any other species of bird for that matter, is to mimic the bird’s natural environment as best as possible. If you can meet all of the finch’s needs and requirements and then go that extra mile then your birds will thrives under your care. And thriving birds are indeed absolute pleasure to keep. To mimic Mother Nature means to be aware of and act in accordance to the changes in seasons that can affect the finches life cycle. This includes the length of daylight, or light quality and availability of your bird room, the availability of foods and the temperature. In the wild the Gouldian finches habitat is somewhere between the tropic of Capricorn and the equator. This means that there isn’t such a diverse change of seasons like we have here in the U.K or other places in the world that don’t fall between the tropics and the equator. As a result the availability of daylight in the Northern part of Australia is little affected between the summer and the winter months… In fact the difference swings between only 12 hours and 14 hours of daylight at the highest and lowest points of the summer and winter equinox. What we can learn from all this is that light availability isn’t the key factor in telling Gouldian finches when it’s breeding season…but more on breeding triggers later. Gouldian finches, like most birds, can see the colour of ultra violet. This is quite amazing for it means they can experience more hues upon the colour spectrum than either you or I. Now try to imagine that for a moment, being able to see a completely new and different colour to anything you have experienced before. Then try to imagine how this new colour can also mix in with the colours we do know, such as blues and reds, to create a wider variety of shades and hues. It’s quite remarkable to think about yet paradoxically not so easy to think about what you have never experienced. 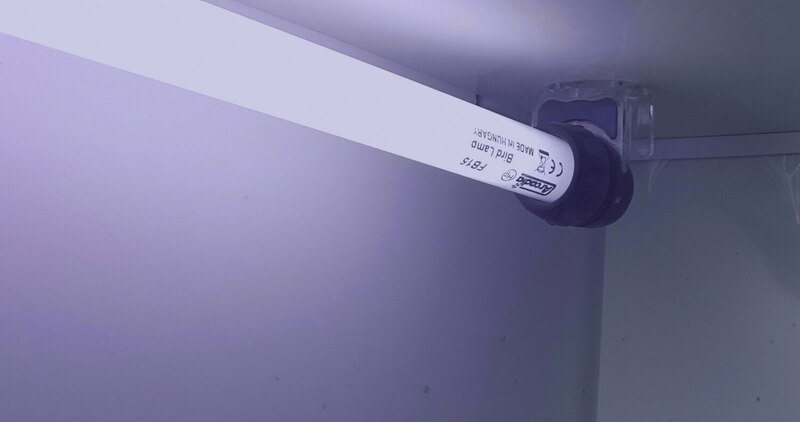 Another important aspect worth taking into consideration when deciding whether to use full spectrum bird lighting is that the birds can synthesise vitamin D from the rays that the bulb emits. The only other options for not using full spectrum bulbs is direct sunlight for at least 2-3 hours a day or to use a vitamin d3 supplement in the bird food. Gouldian finches have a preen gland above the base of the tail which secretes oil. This allows the bird to spread the oil over its feathers when grooming. This oil contains a compound that produces vitamin D when exposed to ultraviolet rays. So when you see your bird grooming under an ultraviolet light source, it’s actually spreading with its beak a new healthy batch of vitamin D on its feathers. The bird then ingests the vitamin D when it next grooms their feathers that are coated in oil. The vitamin D that is ingested into their system is then converted in the liver and kidneys to active vitamin D3. Vitamin D3 is an essential nutrient for all your birds that helps fight against disease and keeps the bird healthy. As well as all the full spectrum bulbs I also provide a standard low watt night light for all my birds. I would recommend this as an important must for any bird room or aviary. Your Birds can and will die from night fright if something panics them while they are asleep. Without a light source they won’t be able to find the perches but they will be able to find the walls, and flying into walls can lead to broken necks or other serious injury. Depending on how you design and build your bird room, or aviary, will affect how well you can control its environment. 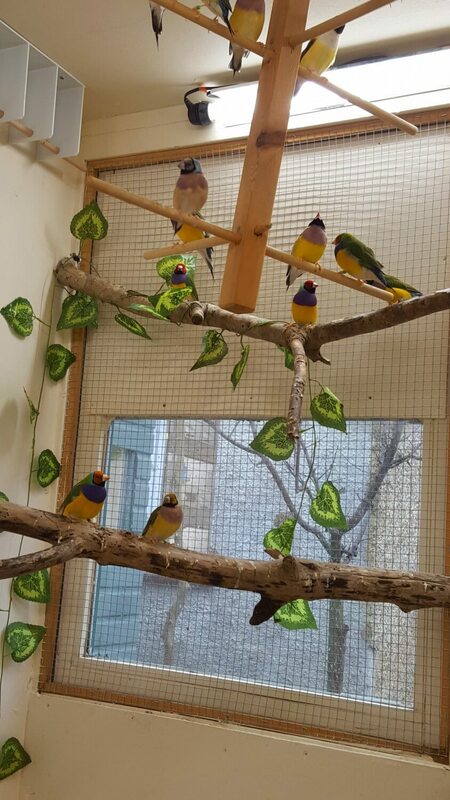 Because the Gouldian finch is a tropical bird, I have designed both my bird room and aviary in a way that gives me greater control over the temperature regulation. 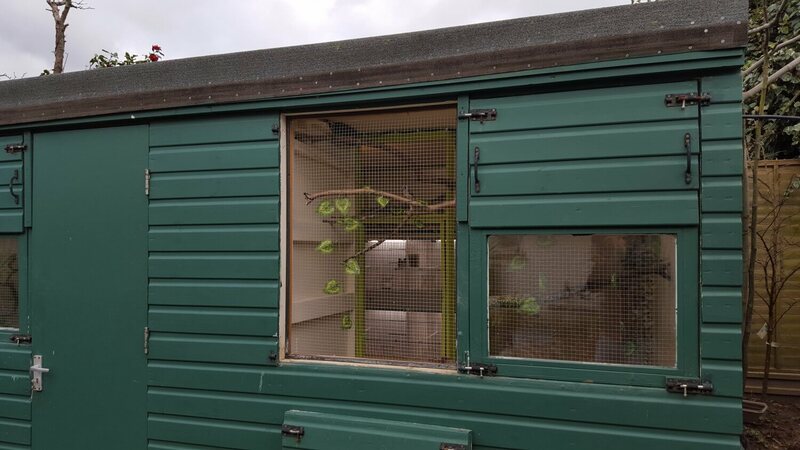 My aviary is completely protected from the outside elements during the winter months. Being well insulated and with double glazed windows, my aviary allows me to run an energy efficient convection heater on a thermostat with a much lower than average running cost. 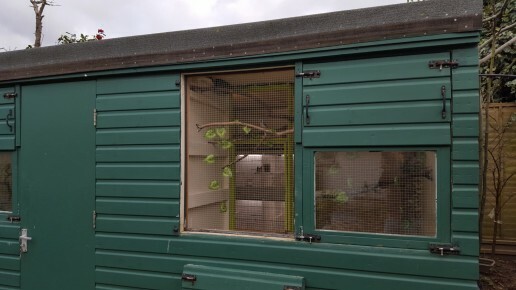 In fact, the aviary is so well insulated that even when the temperature is 3-4oc outside it can maintain a temperature of 21oc-25oc without the need for the heater to even be on all the time. The heater will come on for just a couple of minutes before switching itself off and staying off for around 8-9 minutes at a time. For during the warmer summer months the aviary has x4 large double glazed windows which can be detached completely to reveal a mesh front. 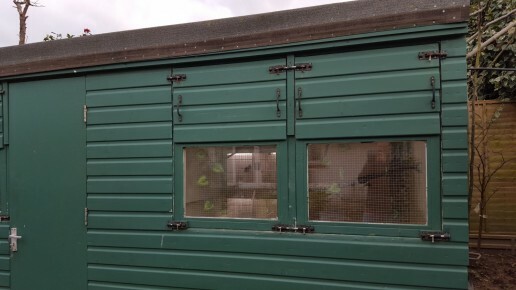 This allows the birds to feel the fresh summer air and gives them access to direct sunlight. Although there are many Gouldian keepers and breeders who allow their birds access to an outside area all year round without problems, this is something that hasn’t worked out so well for me in the past. 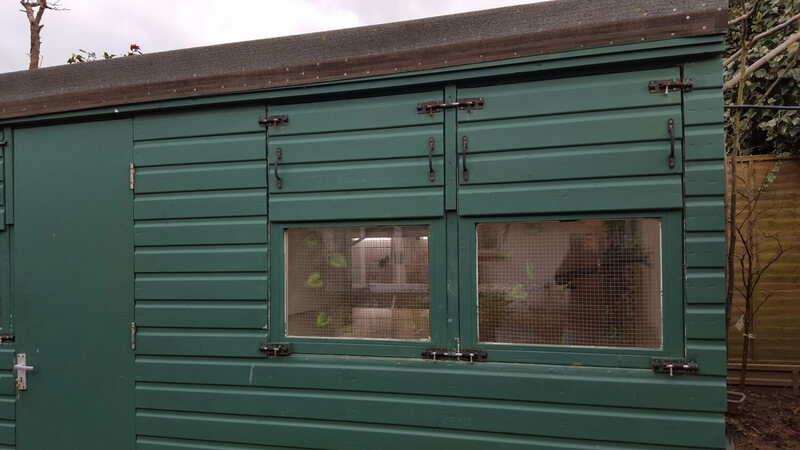 I no longer allow my birds access to an outside area during the colder months as I have lost birds on the occasions they did not go back inside their shed area to roost when the weather deteriorate overnight. 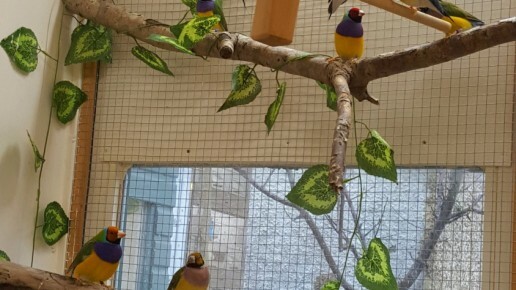 Gouldian finches are especially vulnerable to cold drafts and do not have the type of feathering to help insulated them that certain British wild species of birds have evolved to have. Whilst it is true that birds can become hardier over generations of being kept in tougher conditions, it can take many more generations before a species physiologically evolves enough to suitably adapt to tougher conditions. In the wild, the Gouldian finch has evolved over many hundreds of thousands of years to suit their natural environment. 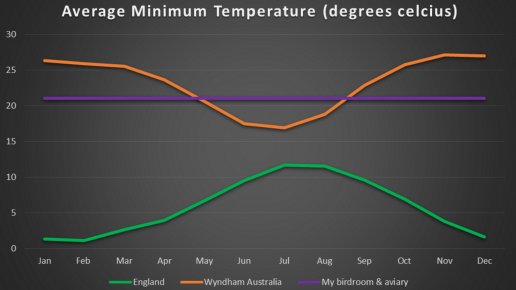 The graph below shows the difference in seasonal climates between England and Wyndham Australia, which has the largest known population of wild Gouldian finches remaining. 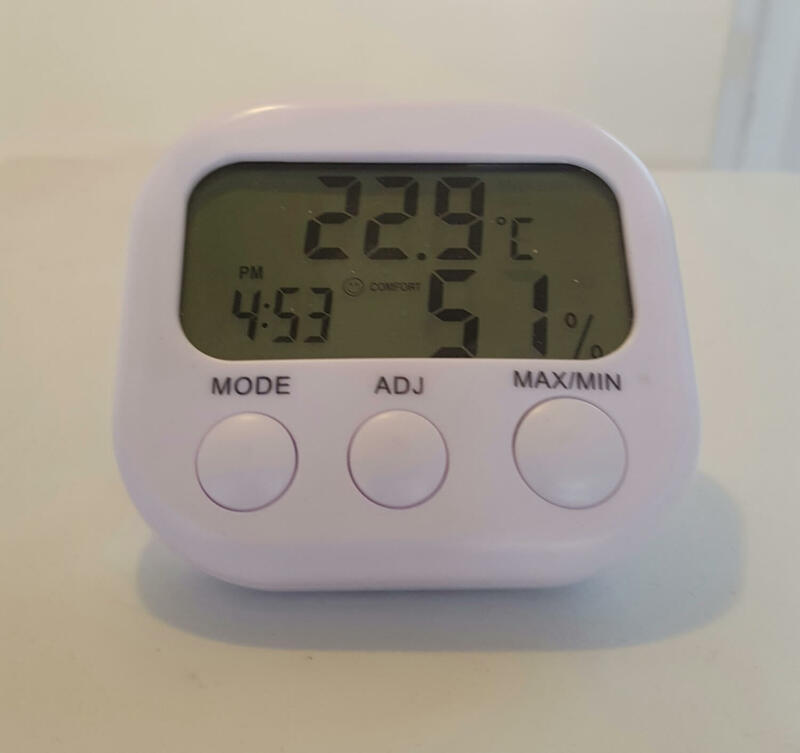 I have also shown the minimum temperature that my bird room and aviary are kept at to demonstrate the extent you are able control a bird room environment when the space has been designed to allow for the required temperature control. 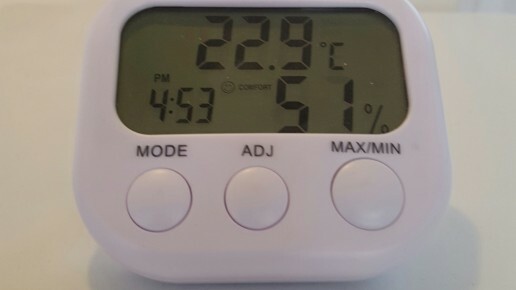 All my heaters are on a thermostat that prevents them from dropping below 21oc. They will heat up my bird room and aviaries to maximum temperatures of around 25oc. Although in the wild the Gouldian finch is used to much higher temperatures, this would be rather costly to maintain and not mention no very comfortable when you go to spend time with your birds. I have found keeping the temperature between 21oc to 25oc to suit both my birds and myself very well. Being aware of the temperature is more important during the breeding season as any prolonged drops below 18oc can kill the embryos of fertilised eggs thus stopping all chick development, this will lead to chicks becoming dead in their shells. For those of you who live in colder climates here is an interesting fact to put into perspective just how much the U.K temperature differs from that of the Gouldian finches’ natural environment in Northern Australia; Since 1875, when we first started keeping temperature records in the U.K, the highest ever recorded temperature has been a freak 38.1oc recorded in Kent. This was phenomenon weather event that happened just once during a hot August afternoon in 2003. The average maximum temperature for the U.K in August currently stands at 20.7oc. To put all this into perspective the average high temperature during the start of the Gouldian breeding season in Wyndham Australia is 39oc. 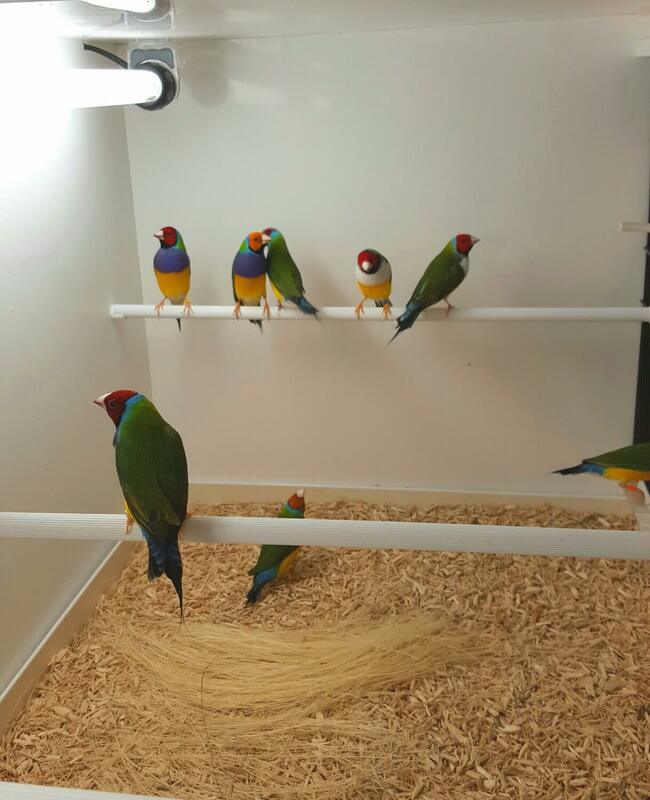 This means that Wyndham regularly has hotter days than the hottest day ever recorded in the U.K.
n the wild, Gouldian finches will experience varying levels of humidity depending on which area of the Northern belt they inhabit. 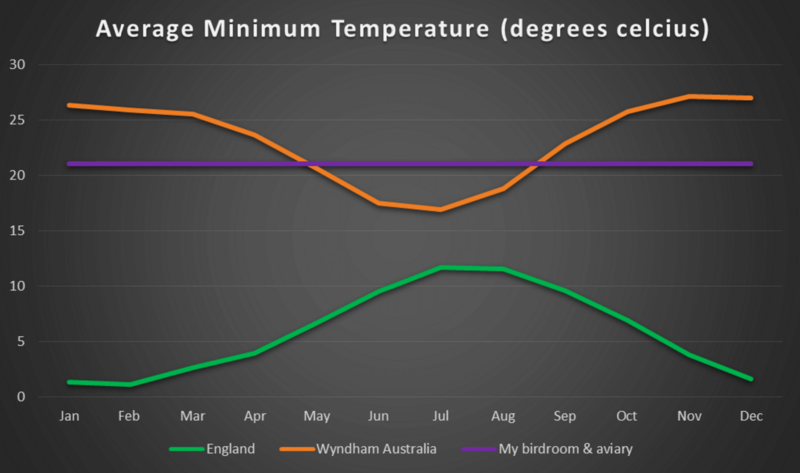 Using Wyndham once more as an example we know that the humidity levels can drop to around 25% during the non-breeding season but rarely peak above 35%. During the breeding season however, the humidity levels rarely drop below 35% and peak at around 55%. It is important to take note of the humidity in our bird rooms and aviaries during the breeding season as levels of humidity that are too high can drown forming embryos before they hatch. A high number of dead in shell and half formed chicks can be a sign of excessively high humidity levels. Humidity levels that are too low can also have devastating results. This can dry out the eggs killing the embryos. Hatching is also a problem as the shell of the egg becomes a lot harder for the chicks to break through when the humidity level is too low, meaning that chicks which do survive to reach the final stage of development can suffocate before they break out of the shell. It is a grim picture to paint but humidity can easily be monitored by the purchase of cheap hygrometer (humidity monitor) for less than £4 ($7 dollars) on eBay. As a rule, I accede the humidity levels between 30%-65% to be acceptable in my breeding room, though I prefer to keep it at around 45- 50%. I have never yet had to use a humidifier in all my years of breeding Gouldian finches, however I do keep a dehumidifier on standby as my breeding room humidity has been known to creep above acceptable levels.